Watching the entertaining ensemble Ben Woodward is establishing with Fulham Opera where everyone ‘mucks in’ and is available to ‘meet and greet’ put me initially in mind of an opera cooperative, even before going to their website where they describe themselves as existing ‘to produce large scale works in the intimate space of St. John’s Church, Fulham. Based on a co-operative business model, cast and crew are paid from shares of the ticket takings after production expenses have been covered.’ All very admirable and now they have moved on from depending on a dubiously-tuned piano (possibly supplemented with a few eclectic instrumentalists) to an accomplished small orchestra of 12, I suggest their future performances are not to be missed by anyone wanting to hear some good singing and enjoy inventive productions making the best use of a small performing space. ‘Making the best’ could actually be adopted as Fulham Opera’s slogan as they are precisely now what I wanted to establish when I led The Wagner Society (last century!) but I could not convince them at the time to stop wasting money: Ben Woodward, director of music at St John’s Church and founder of Fulham Opera, seems to cherish every pound he gets and puts it to good use. After a very ambitious but amazing journey through Wagner’s Ring that was concluded earlier this year, Fulham Opera has turned its attention to Verdi’s Falstaff. 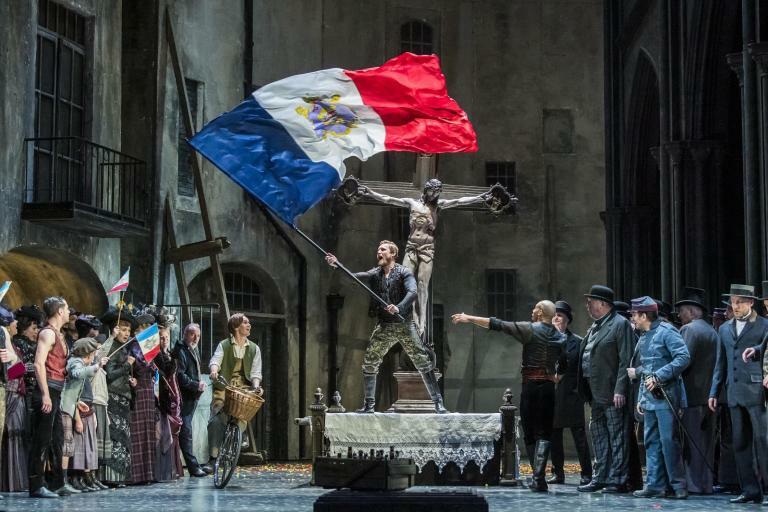 My experience with this opera goes back to Covent Garden’s lavishly traditional Franco Zeffirelli 1961 staging – the first production of the opera after World War II – that lasted until 1978, which I saw a couple of times in its later years with the incomparable Geraint Evans in the title role. I have seen it a number of times during the intervening decades but it never became a real favourite of mine and is on a short list of operas – headed by Ariadne auf Naxos – that I will return to time and again in the hope I will get more from them. Geraint Evans was a rightly famous and well-loved Falstaff and naturally his performance gains a lot because of the ‘rosy glow’ of memory as time passes. However, this must not distract me from believing opinion is still divided about Verdi’s final opera. I always have the impression that there are those who think it is his best and everybody else like me who can (perhaps I now should write ‘could’?) never understand what the fuss is all about. In an informative programme note one of Fulham Opera’s singers, Jonathan Finney, addressed this, as well as, whether Verdi had ‘succumbed to the musical dictates of his contemporary Richard Wagner’ and also explained ‘while it is true that Falstaff has few examples of the melodic barn-storming that are found in Rigoletto, La traviata, Il trovatore, and Aida, melodic spontaneity and fecundity are nonetheless the hallmark of Verdi’s last opera in which to steal Charles Osborne’s happy phrase, “Verdi scatters tunes about as if he was trying to give them away.” ’ Often when I have heard Verdi’s sumptuous score I have cogitated on how wonderful it could be performed in concert independent of the voices, as some ballet music can be. Perhaps it actually benefitted from Tony Burke’s reduced orchestral arrangement making the work much more of a music-drama than I have ever appreciated before and allowing me to thoroughly enjoy every minute of Falstaff for the first time in my life. I much immediately acknowledge the virtuosic playing by the small orchestra conducted by Ben Woodward who, to my ears, gave a seamless, error-free, propulsive account of the score which – because of its reduced state – may not have allowed for much nuance but still had plenty of warm colours and atmosphere. The show lost its original director at short notice and Daisy Evans stepped in with two weeks’ notice and produced a show that was high in energy and genial good humour telling Sir John Falstaff’s tale of gluttony, drunkenness, lascivious, humiliation and redemption very well indeed. St John’s Church ‘donates’ its altar as the centre piece for most of any opera’s action with all the paraphernalia for its services consigned to the side of the building. Here it was dressed up as the bar of the Garter Inn and reminded me of pubs in Basildon any night of the week what with all the hoodies, sweat shirts, jogging bottoms, T shirts, jeans and trainers for the men … and the bling, leggings, micro mini dresses and stilettos for the women. The red shiny suit Falstaff wears when he dresses up perhaps took us across Essex to Brentwood’s infamous Sugar Hut night club! Surrounded by a few tables and chairs the bar was the centre of the action of most of Acts I, II and III and apart from a couple of large laundry bags, a few ‘weapons’ (such as a cricket bat and a whisk! ), and several plastic umbrellas with a rainbow design, that was it … yet it all worked. The concluding scene at Herne’s Oak had a wonderfully sullen looking ‘living tree’ from the show’s producer, Janet Fischer, brandishing two leafy branches – if not unfortunately from an oak. Beware where you sit because if you are close to the centre aisle you could be almost intimately involved in the action yourself. The greatest pleasure of this Falstaff came from the work of Keel Watson as old blowhard Falstaff who has done nothing worse than send the same fanciful love letter to two married woman who know each other. The opera works only if we genuinely care about Falstaff and the naturally well-padded Keel Watson – whilst not ignoring his character’s dark side – makes him into the kind of irrepressible old rogue you would like to have a beer with – and there was quite a lot of realistic looking beer being drunk throughout the show! The role is often considered as dominated by long stretches of patter with intermittent shouted outbursts and only a few moments of sustained singing, however Keel Watson – like some of the great Falstaffs before him – finds a lyrical thread in some potentially choppy Verdian phrases. His sound is virile and exciting and it bodes well for his Dutchman for Fulham Opera’s Der fliegende Holländer next year. He commanded the proceedings with a wobbly gait and an acknowledgment of his ‘beer belly’ that brought his Falstaff to real life. There were some other excellent voices to be heard; in particular, I was much taken by Catharine Rogers’s Alice Ford, beautifully sung with great power and flexibility – and this was not just because she was singing almost in my lap at one point! She was a wonderful discovery as were the pair of attractive young lovers, Roberto Abate (Fenton) and Caroline Kennedy (Nannetta) who both had alluring sweet tone and expansive top notes. Everyone involved had a moment when they really shone although some were better singers than actors, or vice versa. What is clear is that Ben Woodward is engendering a great spirit amongst a number of stalwarts – notably, Oliver Gibbs’s Ford, Lindsay Bramley’s Mrs Quickly, Jemma Brown’s Meg Page, Jonathan Finney’s Bardolph and Antoine Salmon’s Pistol – all working again with Fulham Opera in this production, as well as, being able to give a number of other very talented singers the opportunity to show what they can do. Most of these I have already mentioned, but there was also Brian Smith-Walters who portrayed Dr Caius uniquely as a bit of a ‘bruiser’. The famous line ‘he who laughs last, laughs best’ (or whatever it was in the very amusing, vernacular, translation that was projected) concludes this comic opera. This chorus is a complex fugue involving all the soloists; as performed here it was a resplendent ending to a thoroughly entertaining and uplifting evening – do go see this Falstaff if you still can.